Founded in 1929, H&C decorative concrete products have been protecting and beautifying concrete surfaces for years. H&C concrete sealers are known for their high-quality and strong adhesion properties. They offer a wide range of products such as sealers, resurfacers, waterproofers, and much more. The H&C concrete sealers can be applied on various concrete surfaces such as driveways, pool decks, patios, garage floors, basement floors, walkways, and stucco. The brand as well provides technologically advanced products and they have one of the best customer care services. Their sealers will add years of life to your old or new concrete surface at just a great price. In this H&C concrete sealer reviews, I have come up with two of the best H&C concrete sealers after carrying out thorough research. I have tested these sealers and I can attest that they are one of the best. The sealers are easy to apply, long-lasting, and excellently protect your concrete from dust, water, thaw, and other harsh elements. 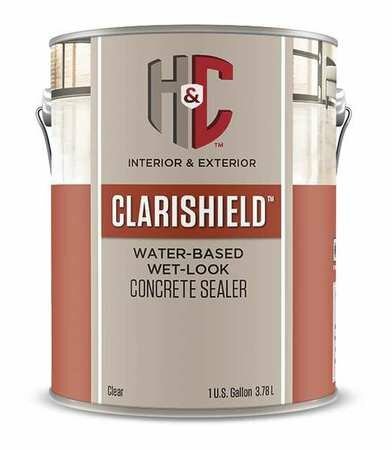 If you intend to coat both interior and exterior concrete surfaces in your home, this is the best sealer for you. The H&C concrete floor sealer features a high solid content formula. It is easy to apply and dries fast. After coating the sealer on your driveway, it will only take 1 hour to dry and it can be recoated after 2 hours. One gallon of the sealer will cover between 200 and 300 square feet. You can use a spray or roller to level the sealer on the surface. The sealer works best when sealed in temperatures of around 50 to 95 degrees F. And for proper drying, the manufacturer recommends to leave it for 72 hours. The sealer will protect your driveway, patio, paver, pool deck, and even walkway from elements like UV rays, dust, spills, water, and deicing chemicals. 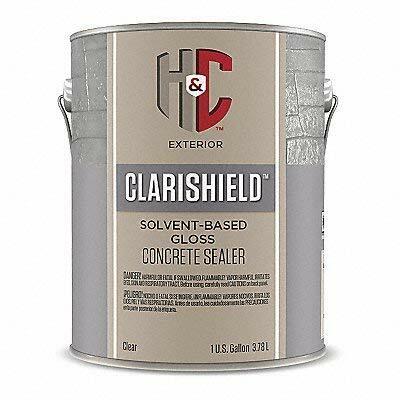 The H&C concrete dustproofer floor sealer is a solvent based and silicone resin type sealer. It is great for those who are looking for a sealer to apply to exterior concrete surfaces in their home or for commercial. It doesn’t matter if your floor is made of concrete, brick, masonry, or stone, it will still protect it from thaw, dust, and water. In addition, it prevents the growth of mold and mildew and resists UV rays from damaging the concrete. After applying, the sealer will leave your surface with a shiny glossy appearance that many homeowners desire. For perfect performance and durability, apply the wet look sealer when temperatures are between 50 degrees F and 90 degrees F. Use a sprayer or roller and it will be dry after 1. Apply the second coat after 4 hours. For car use, 24 hours should be enough. It cannot be used on interior concrete surfaces such as kitchen or bathroom floor. H&C is one of the top concrete sealer brands on the market and they are known for their quality and technologically advanced products. After reviewing the above products, it is now your turn to select one that you feel meets your needs. Though they have similar features, one is great for indoor use and the other can be used on both indoor and outdoor concrete surfaces. Q. Can an interior concrete sealer be used for exterior use? Ans. For the best results when using sealers, always follow instructions and use the sealers as recommended. If the sealer is meant of only interior or exterior use, don’t use it anywhere else. You will just end up being disappointed. It is just like using a sealer meant for only concrete on an asphalt surface. The results will not be good for you. Q. How much time do you have to wait to apply the second coat? Ans. In the case of H&C concrete sealers, it is recommended that you wait for the first coat to seal, which normally takes one hour and then seal the second coat after 4 hours. This varies from one sealer brand to another. So, it is important to check the recommended period in the instructions.